Home » Singapore Immigration Visa » How to obtain Singapore Work Permit ? Singapore is becoming a profitable and ideal business hub for Southeast Asian countries because of its innovative immigration plans that entice experienced entrepreneurs and working experts from all over the globe. 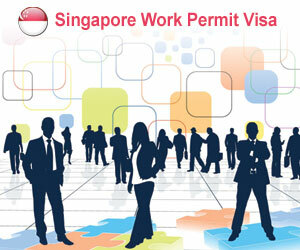 Overseas individuals who aim to reside and work in Singapore must have a valid work permit. This permit allows foreign individuals to work in Singapore and receive a basic salary of not more than $1,800 per month. To obtain Singapore work permit applicants need to fulfill the necessary requirements in order to work and stay in Singapore. According to the Employment Act, to apply for Singapore work permit applicants should meet minimum age requirement of 16 years. For the purpose of Singapore work permit application, Malaysians age should be less than 58 years, whereas non-Malaysians should be less than 50 years during lodging of visa application. Workers should be from an approved source country. Applicants can apply for work permit either through online or manual. In online Singapore work permit process, it takes one working day to process work permit while, in some complex cases like Sponsorship, Joint Income or applications for which more documents were asked may take around seven working days. Whereas in the manual process it may take seven working days to process the work permit. The processing time may be subjected to change based on the applicant’s profile. Once the work permit is issued, applicants can migrate to Singapore within one year of their application to work and stay in Singapore. If you want to apply Singapore work permit, please fill MoreVisas Enquiry form, and also follow us @ Facebook, Twitter, LinkedIn. ← Are Immigrants in Canada more skilled than Immigrants in US ?